For the last 30 minutes, I've been hearing the stopping and starting of a car driving without lights. It's dead quiet on the pass. All I have to do is get my knee warmers, sweater and gloves on and get down the pass. I know that once I get off the bike, I'll be helpless. But I haven't heard much for a while so I will try to be quick. Some time ago, an unmarked truck drove slowly by, pulled over ahead and killed his lights. I'd pedaled by quite nervously. There was a bright moon, but I still couldn't see the man's face well or even if he had gotten out of the truck. The vehicle was grey, I think, but the moon made it hard to judge colors. 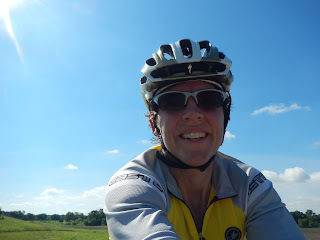 I recalled that I was not the last person, thus this couldn't be a vehicle associated with the ride (we had been told several times that the sweep followed the last rider and I knew there was a tandem miles behind me). Besides, they would surely have identified themselves if they were? I'd seen other cars on the road, none have stopped and driven without lights. I felt uncomfortably mouse-like. At least on the bike, I had the option of fleeing. That's a cold comfort on a cold night. I have a 911 button on my SPOT tracker. Hitting it was an option too - but help would probably be late in coming. I've got everything out and have unzipped my jacket to add the layers. Then I hear it, the sound of the truck coming up - the lights below suddenly go out. There is now no time to lose, I throw the extra clothes off the bike to the side of the road and hurl myself down the pass as fast as I can. It's absolutely FREEZING with my jacket open and after a couple minutes, I have to stop. As I zip up and at least get the phone stashed, I can hear the truck coming in pursuit. Back down on the very fastest descent I ever want to do in the dark. Every panic moment I've every lived through flashes by my eyes. Even at 30+ miles an hour it takes almost 15 minutes to get to the bottom. At the bottom, I turn and pedal as hard as I can blowing every bit of energy I have - there are still a few miles to Twisp. At least the sprint is warming. As I finally pedal into Twisp, there is a support stop there. I just sit there shaking for some number of minutes. It pretty much blows the ride that I survived: 735 miles of heat waves, sandstorms with 50+ mph winds and 40,000 ft of climbing. Though in the end, I'm actually felled only 18 miles from the finish by a newly discovered ultra severe allergy to something along the Centennial Trail - Severe Anaphylactic Reaction is the diagnosis in the paperwork from ER. Epinephrine, a nebulizer, several hundred milligrams of intravenous steroids and Benedryl do the required job of re-opening my throat and lungs. I wind up with bleeding in my nose for days. ​It's 6 days later, the huge doses of steroids and the taper have been super rough - the no sleep side effect and tachycardia are terrible. I continue to have flashbacks to the whole experience. As I process through this, I'm met with wave upon wave of different feelings. Fear and then anger that this was avoidable with a sign or just leaning out the window to say "I'm with the ride, don't worry". Above all, it digs up other unpleasant memories long buried. I recall the second day of this ride. Someone coming up to me and saying, "the guy I have been riding with isn't feeling well, what should I do?" Before I could answer, the long-time rando standing next to me says, "Leave him, it's the rando way". Really? At this point, I honestly want to hate this sport. I want to sell all my bicycles and never touch them again. It's a little like slipping closer and closer to the edge of a big cliff. I try to tell myself over and over that this was a misunderstanding, that it's no ones fault. Yet a part of me still screams that this was the fault of bad information given and rules not followed with little regard for their ultimate consequence. It wants to become about the sport now instead of about a single experience. If it really had been some evil jerk, I could feel like I accomplished something by escaping. As it is, I struggle against feeling like this was the organization that did this to me. It was far easier having a horrible brain injury that I can't remember - this I remember in exquisite detail. In any case, I'll never go back to the Pacific Northwest - if only because now I know there is an unknown plant there that can kill me - they say next time a reaction will likely be much worse.